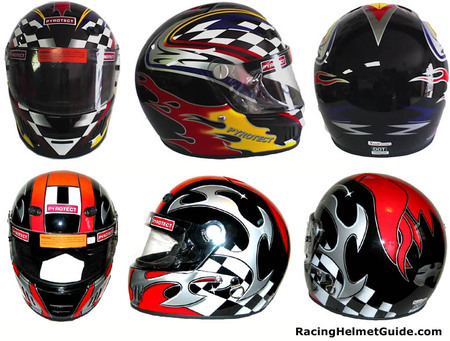 The Pyrotect Pro Airflow helmet is our best selling Snell SA2005 rated full face helmet. It features a strong and lightweight fiberglass shell, large eyeport, and a .125" flat polycarbonate shield w/multi-step ratcheting pivots. The shield is equipped with tear off posts that accept standard Bell-style tearoffs. The helmet offers great ventilation with eight slotted vents in the chin bar, two vents on the forehead that open and close, plus two small top/rear exhaust ports. Combine that with Pyrotects patented Airflow liner and you have a helmet that will keep you cool in the hottest weather conditions. Additionally, the liner can be removed from the helmet and washed or air dried. To fine tune the fit of the helmet you can purchase thinner or thicker cheek pads separately. 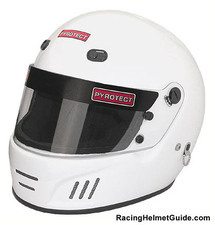 The Pyrotect Pro Aiflow helmet is available in either gloss white, gloss black, flat black, tribal graphics, or flame graphics (photo below). If you are looking for an inexpensive Snell SA rated helmet with the features of helmets costing twice as much, the Pyrotect Pro Airflow is definitely worth a look. - Patented air-flow liner that is fully removeable/washable!